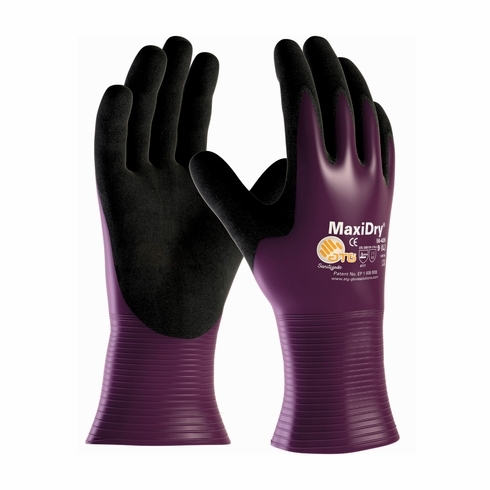 PIP, MaxiDry® Ultra Lightweight Nitrile Glove, Fully Dipped with Seamless Knit Nylon / Lycra Liner and Non-Slip Grip on Palm & FingersPIP, MaxiDry® Ultra Lightweight Nitrile Glove, Fully Dipped with Seamless Knit Nylon / Lycra Liner and Non-Slip Grip on Palm & Fingers, Item # 56-426, Known and loved across the globe MaxiFlex® has become the world standard for precision handling gloves in dry environments. Known and loved across the globe MaxiFlex® has become the world standard for precision handling gloves in dry environments. People have been asking ATG® to make an oil repellent MaxiFlex® that's still super thin, flexible, dexterous and comfortable. So they did. Here it is. They call it MaxiDry®.